Encouraging and supporting heritage tourism is one of the best things we can do for Caribbean island nations. It has positive economic impacts at the grassroots level, establishes and reinforces identity, differentiates you from other islands in the Caribbean, helps to preserve a nation’s cultural and historical heritage, and facilitates harmony and understanding amongst peoples. Cultural tourism concerns the environment of a place, the visual, written, and performing arts, local lifestyles, traditions, history, and the values that make a nation unique. The ripple effect of supporting and promoting heritage tourism is immense and important. By supporting local businesses, environments, and arts it keeps more people in the area, creates more jobs and opportunities, and facilitates regional development. Cultural tourism helps to find that essential balance between protection and overuse of heritage. It can lead to a revival of traditions, the restoration of historic places, a resurgence of national pride, and a corridor through which to to explore and develop sustainability measures both for the environment and treasured sites. And if all the points mentioned above weren’t reason enough to promote and support heritage tourism, cultural tourism is in-line with modern travel trends as more and more travelers seek authentic experiences that can’t be replicated elsewhere. Cultural tourists tend to spend more money and travel for longer than others. Cultural tourism is potentially a big business. Just look at the emergence of Cuba as a cultural tourism destination. People are flocking there to have the experience of Cuba before it’s all gone. They’re curious about the culture and history of the place, and wisely so. The fish fry in Turks and Caicos, carnival in Trinidad & Tobago, waterfalls in Jamaica (and let us not forget Scotchies’ Jamaican jerk chicken…), Soufrière and the Gros Islet jump up in Saint Lucia, cooking classes in Martinique, the baths in BVI – there’s so much out there in the Caribbean and there’s so much room for more of it. Every single island has a lot that is sellable and distinct from any other Caribbean nation. For all these reasons and more, we here at coralrange are proud to support heritage tourism initiatives and the recent launch of Island Effect in Saint Lucia is one of them. 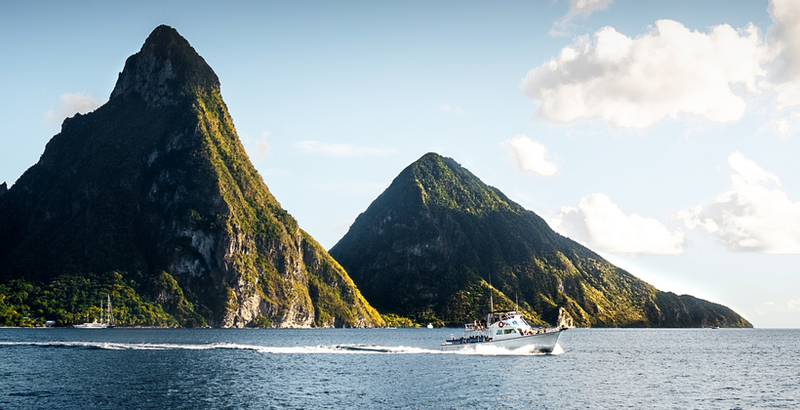 Island Effect is an ethical travel inspiration business and their mission is to get everyone – locals and visitors alike – exploring Saint Lucia’s fascinating places. We were thrilled to work with Finola Jennings Clark, the founder of Island Effect, in designing & developing a website for all the cultural heritage content that the Island Effect editorial team has and will be producing. 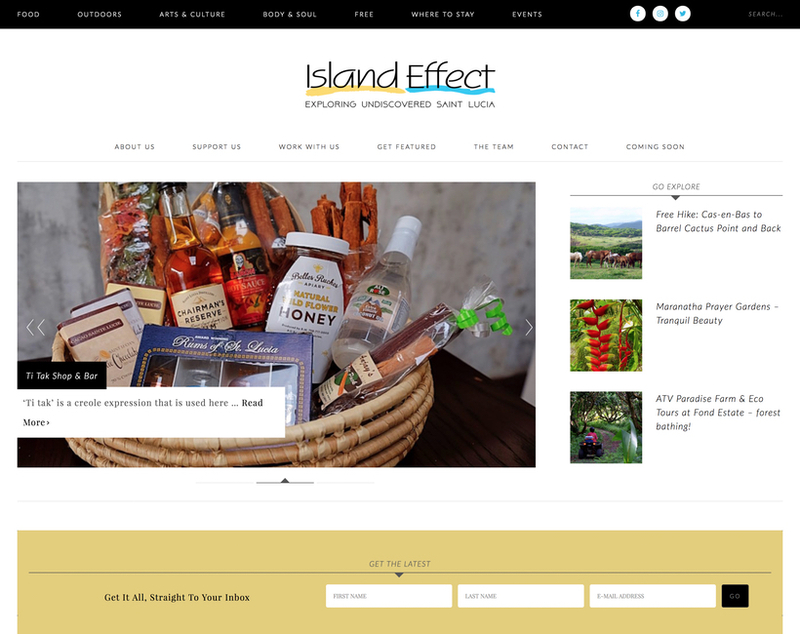 Island Effect’s logo that was presented to us as a starting point for the website incorporates the blue and yellow of the St. Lucian flag and so we developed the website to complement and complete the flag colors with black and white. 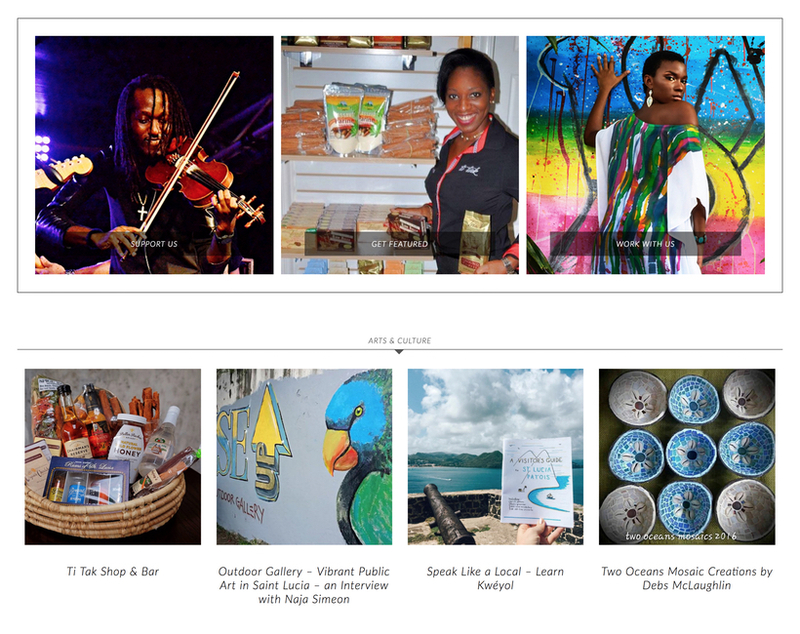 You’ll also notice the use of triangles on the dynamic homepage which harkens to the iconic Pitons in addition to complementing the island’s new branding by Saint Lucia’s tourism authority. We kept the overall look clean, to showcase the vibrant content at its best, and modern to reflect today’s travelers, Saint Lucians, and the fact that heritage tourism and the future are inseparable. There are many features throughout the website to keep visitors engaged, exploring, and sharing (we encourage you to do the same!) and the site will be regularly adding new features to keep visitors coming back again and again. Heritage tourism has never been so important and we look forward to continuing to support and promote both Island Effect and other cultural tourism initiatives throughout the Caribbean. Need help creating a new website or revamping an old one? Get in touch here or at hello@coralrange.com.